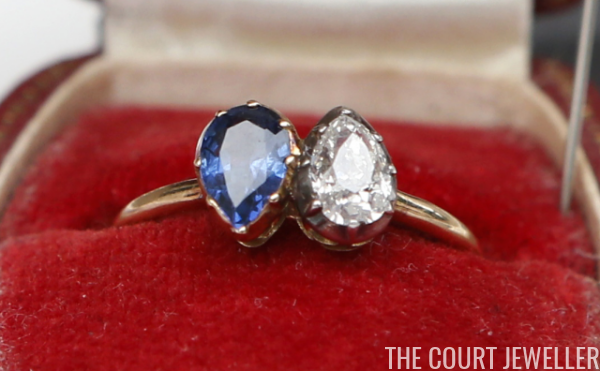 Over the centuries, royal engagement rings have been trendsetting pieces. One of the most influential royal rings for nineteenth-century jewelry lovers was an unusual ring exchanged by two of the most significant figures of the time: Napoleon and Josephine. To celebrate their engagement, Napoleon reportedly gave Josephine today's ring: a sapphire and diamond toi et moi ring, featuring two pear-shaped stones that each weigh just under one carat. It was an extravagant purchase for a military man who had not yet climbed to imperial heights. The couple married in 1796, but their relationship was doomed. Both were unfaithful, and after Napoleon became emperor, Josephine's failure to provide him with an heir was the final straw. They divorced in 1810 -- although both maintained that they still loved and were devoted to each other. When Napoleon died, Josephine's name was his last word. Josephine gave the ring to her daughter, Hortense, who was briefly Queen of Holland through her marriage to Napoleon's brother, Louis Bonaparte. For two centuries, the ring remained with the extended Bonaparte family. Hortense's son, Napoleon III of France, inherited it from his mother; his only son, the Prince Imperial, died without descendants, so the ring passed to Victor, Prince Napoleon (the grandson of Napoleon's brother, Jerome Bonaparte). 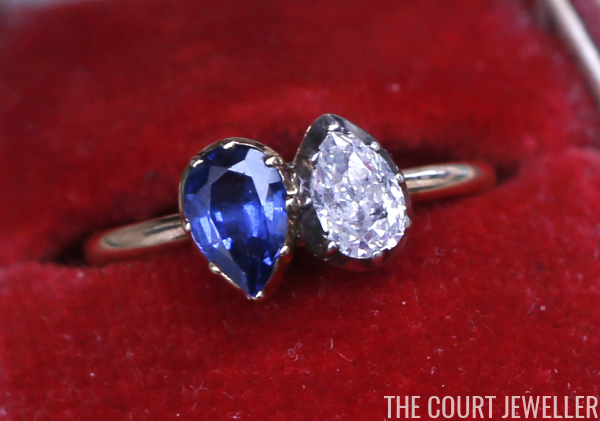 The ring was auctioned in 2013 with possessions belonging to Victor and his wife, Princess Clementine of Belgium. In the photo above, you can see that the ring rests in a box from a Belgian jeweler, Altenloh, that did work for the Belgian royal family. 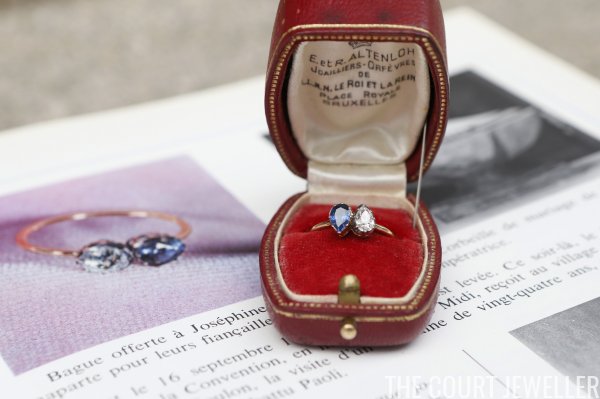 The ring was sold by Osenat, a French auction house. 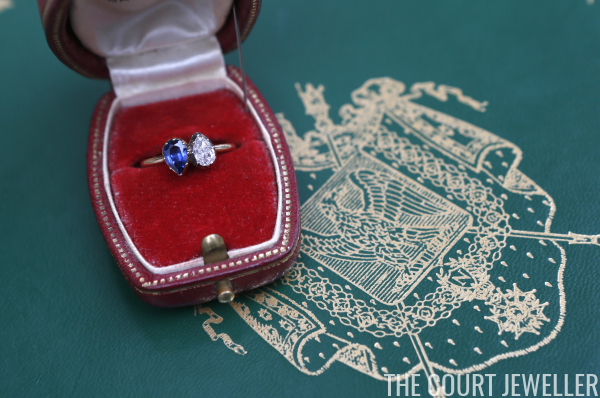 Curiously, the auctioneers decided to determine the auction estimate for the ring based solely on its materials and design, deliberately not factoring in the piece's imperial provenance, even though the jewel's connection to the Bonapartes was heavily advertised. The auction was even scheduled to coincide with the 250th anniversary of Josephine's birth, so it should come as absolutely no surprise that the high estimate of $20,000 was absolutely demolished. When the hammer fell, the ring had fetched nearly $950,000.